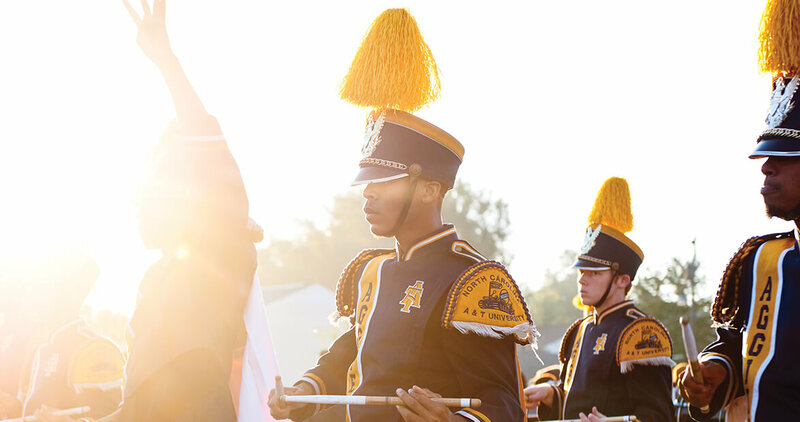 You don’t just walk into “The Greatest Homecoming on Earth” at North Carolina A&T State University. You step into it. You glide and you dance and you bring your best game. 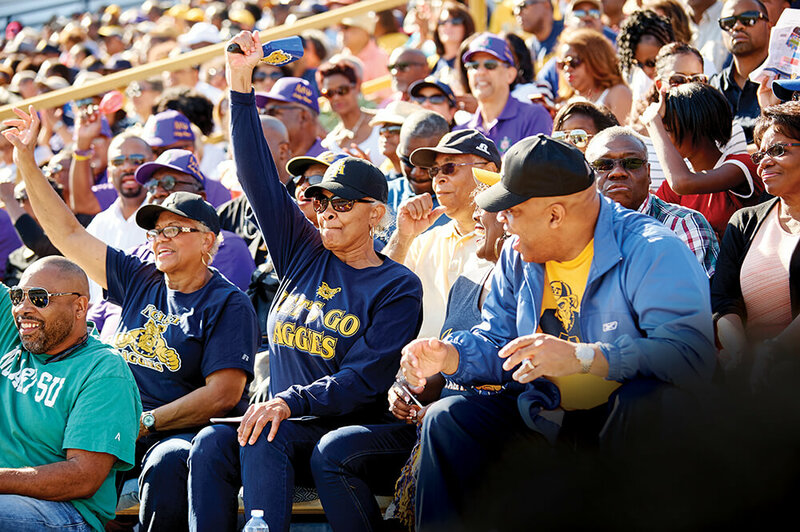 North Carolina A&T State University does homecoming like no other college. It’s not so much an event as it is a happening. Yes, there’s a football game. But that comes later, after the parade. After the Pan-Hellenic step show. After the concerts. After the pep rallies and the coronation of Mister and Miss A&T. After the tailgating and the all-night parties and the dances and the golf tournament. And, of course, you come to the GHOE — the Greatest Homecoming on Earth — in style or you don’t come at all. I’ve been coming to A&T homecoming games for 30 years, and I still don’t know how to describe the spectacle to a newcomer. But here’s some advice: Come early. 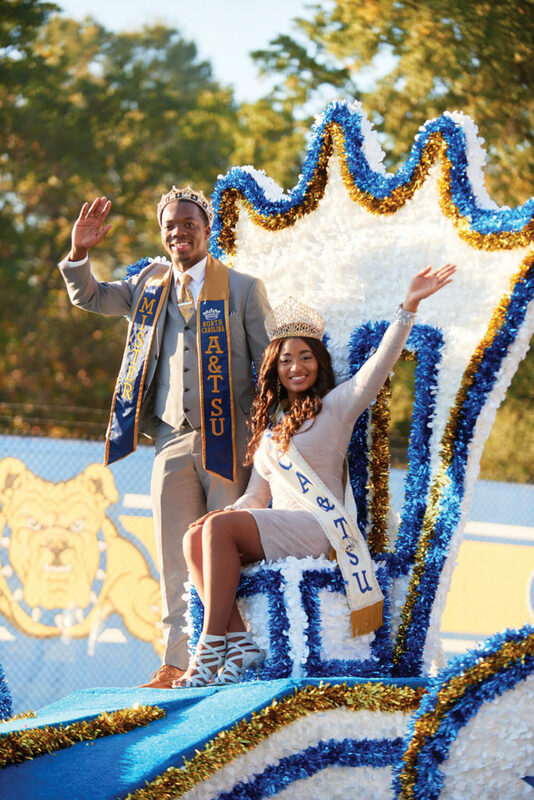 Homecoming at A&T doesn’t have a starting time, and it doesn’t really end. But there was more to it than that. Homecoming for the school, officially founded in 1891, takes on a life of its own. The football coaches know it. The players know it, too. 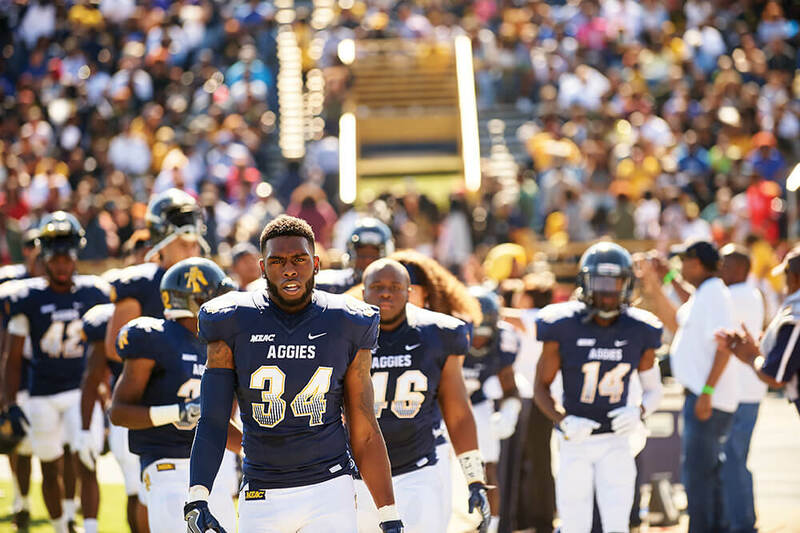 A year ago, moments after the Aggies had thrashed rival Florida A&M University (FAMU) 42-17, senior defensive tackle Marquis Ragland explained how football fits into the homecoming festivities. First, everybody on the team has to play. 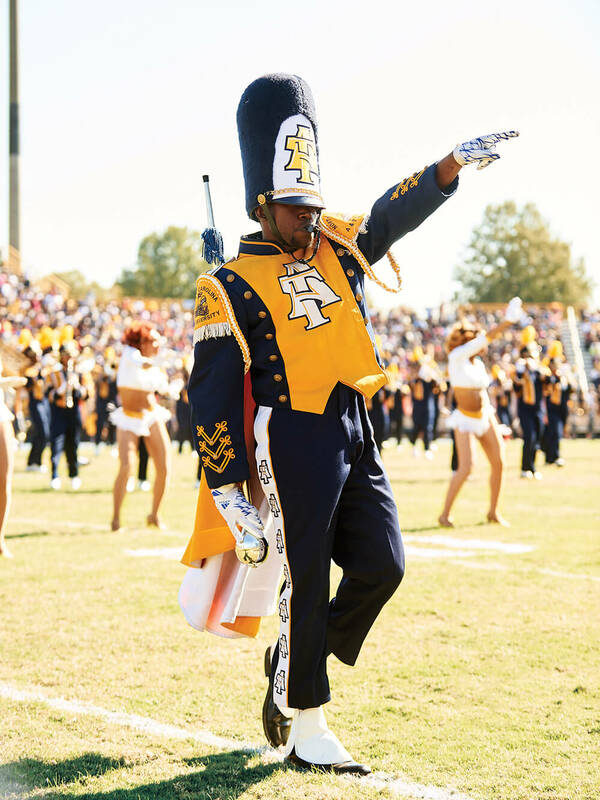 Second, everybody has to acknowledge everybody else, from the band — A&T’s nationally acclaimed Blue and Gold Marching Machine — to the cheerleaders and majorettes, to the thousands of fans who pack Aggie Stadium. 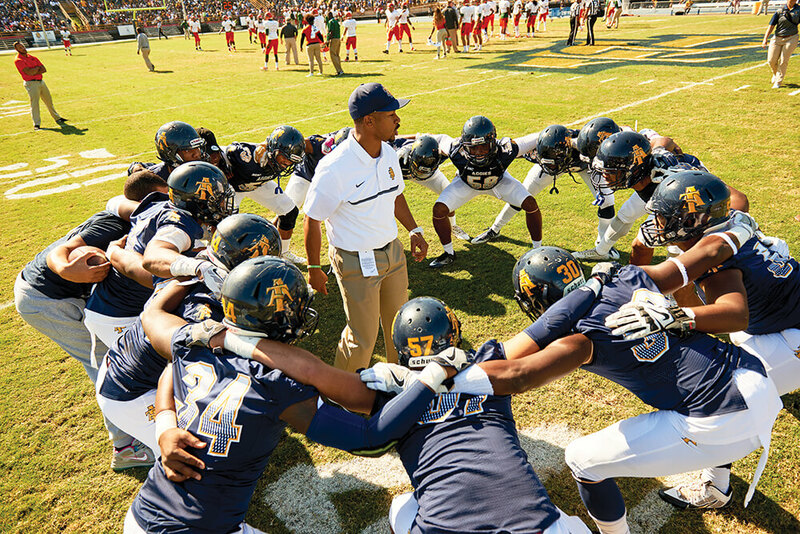 The GHOE is a show, but it’s also a tradition, a weeklong slate of events that take a year to plan. But the beauty of it is its unplanned audacity. Who in the world would dare call their homecoming the greatest on earth? “We do!” says Denise Morehead, an alumna (class of ’99) who is selling T-shirts under the stadium on game day. There are hundreds of styles and colors, ranging from infant onesies to XXXL tarpaulins, all embossed in Aggie blue and gold and the bold GHOE on the front, some in block letters and some in cursive, some in sewn lettering and some in sequins. “Which one do you want?” she asks as I walk away. “I didn’t go to school here,” I tell her. That seems to be true the morning of the big game. Streets are blocked off between downtown and the sprawling campus off East Market Street. They still do floats at A&T, a tradition now long forgotten at other colleges. Greensboro officials estimate that the GHOE has an annual economic impact of about $8.9 million, making it one of the biggest weeks of the year for the city. “Reverend, I think this homecoming thing might work out,” I told him. “I was talking about our football team,” he said. I asked a lot of people that day to describe the “Greatest Homecoming on Earth,” and I got a lot of responses about reunions and togetherness and food and football. The night the legendary James Brown came to A&T back in 1971 remains a topic of conversation for Aggie alumni. They say the Godfather of Soul touched something inside the A&T students that they still talk about today. They call it Aggie Pride. And it’s real. And so is the GHOE. Ed Hardin is a sports columnist for Greensboro's News & Record.